During live broadcast coverage of a student demonstration on April 4th, Laith Marouf, Concordia University Television (CUTV) Program Director and cameraman was arrested by riot police while reporting live during the demonstrations. After careful deliberation, students in the MA Media Studies program at Concordia University have collectively decided to renew our strike on an ongoing basis, to be reviewed weekly. We demand that the Charest government open dialogue with students and rescind the scheduled tuition hikes. In accordance with the GSA’s resolution, we will not be attending class nor submitting coursework in recognition that they are inseparable. We agree with PhD students in the department that to submit coursework while not attending class implies that class time is irrelevant. We also declare our support for doctoral, undergraduate, and diploma students in Communication Studies in their own ongoing strike actions. Our position reflects the majority of students in our program, but we also acknowledge the individual circumstances that may limit the extent to which some of us can participate in the strike. We see this action as a strike and not a boycott – in ceasing our coursework, we seek to make visible the detrimental impact of tuition hikes on our futures but also to make visible the very real labour of our research and course participation, which enriches the programs and atmosphere of our department, individual professors’ research, and the university at large. We understand that a student strike differs from a labour strike, and we use such language knowingly. Although we may not be bound by a labour contract, we are part of a student association and feel that the strike is a necessary collective action. In calling our action a strike, we seek to align ourselves with student movements and protests province-wide against privatization and for academic freedom and accessible education. We do not consider ourselves consumers passively receiving a service (as the term “boycott” implies); we believe that education is a right. By participating in the strike, we believe that we are raising the bar for the quality of education and research in the Department of Communication Studies. We feel strongly that low tuition fees allow students from diverse backgrounds to attend university, which in turn nourishes the quality, creativity and diversity of our programs. On March 22, students and faculty from the Department of Communication Studies marched together in order to speak out against tuition hikes and privatization, and in support of accessible education. We joined in protest with members of the community in a broader social movement: parents, grandparents, children, business people, and union members are all part of the fight for accessible education. This movement is exemplary of our ongoing solidarity: students and faculty are now working together in the community. Our desire is to continue to move forward with you. We appeal to faculty for continued solidarity in our struggle against the Charest government’s position. Beginning this week, we intend to expand our strike actions to focus upon public media interventions. 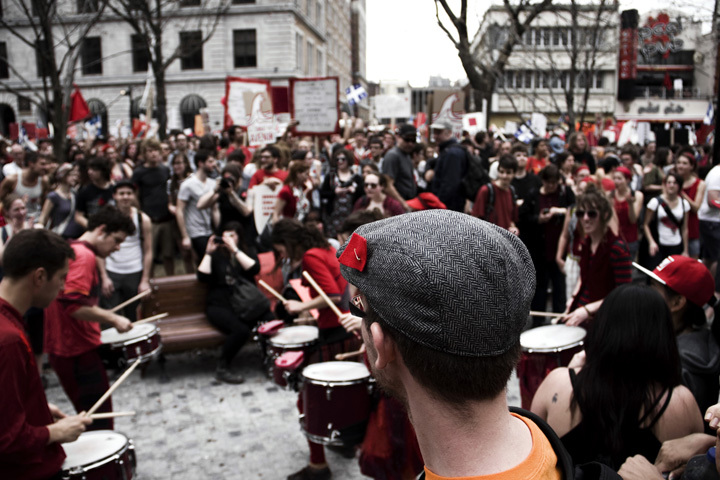 Although we do not think that online dialogue is a replacement for the productive conversation and face-to-face interactions that take place in the classroom, we appreciate and support the alternative ways in which professors have initiated dialogue and made public their views on the tuition hikes in solidarity with students’ actions. Examples of these efforts are the websites http://altunies.wordpress.com and http://profscontrelahausse.org. With the growing solidarity among students and faculty, we would like to request an opportunity to meet with faculty in the next two weeks. In this meeting, we will engage in dialogue with professors about working together, in solidarity, during the course of the strike and to answer any questions that faculty may have for us. We would like to send representatives from our cohort, along with representatives from the undergraduate, diploma, and PhD programs. Our aim is to find collective ways to channel our growing momentum to levels that reach beyond our department. Once again, we appreciate the support faculty have provided thus far, and we encourage you to continue supporting us in our call for accessible education. On March 22, students, teachers, union representatives, politicians, parents and other concerned citizens converged onto the streets of Montréal to demonstrate their opposition to the current Québec government’s tuition increases and in support of accessible education. 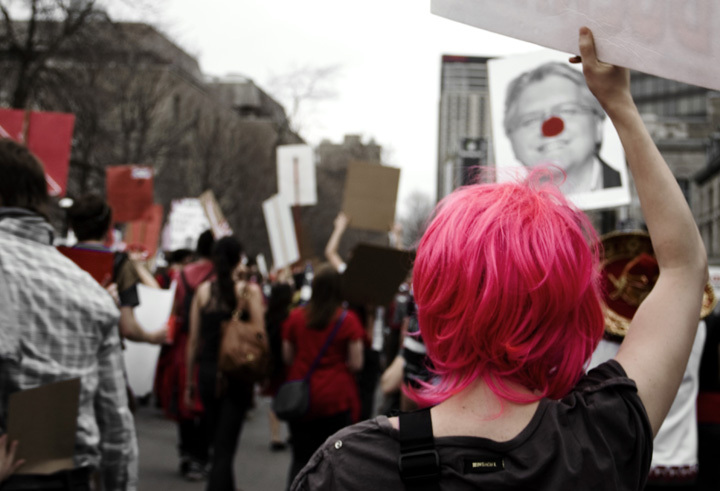 Students from universities CÉGEP’s throughout Québec (and elsewhere) made their way to Montréal to show that the strength of a social movement is in its numbers. But exactly how many people marched in the streets, who decides and how are they counted? Official route for the March 22 demonstration. It was a beautiful day with temperatures hovering above 22°C with a 10-minute shower toward the end of the afternoon that was unseasonably refreshing. The main gathering place was Dorchester Square/Place du Canada at the corner of Peel street and René-Lévesque boulevard (A on map) with a final destination, 5.5 kms later, at the Old Port of Montréal (G on map). 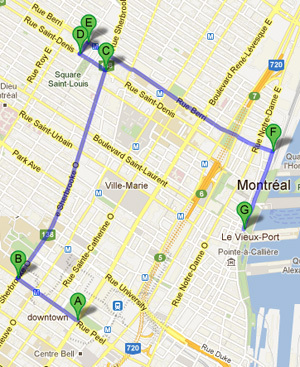 The official route went north on Peel, east along Sherbrooke street then south along Berri street. The size of the crowd and the funnel effect leaving Dorchester Square led protesters to add a secondary route out of the Square on Metcalfe, a street parallel to Peel. Like all flowing masses, the march branched out again along paths of least resistance off the main route, to head eastward along Ste-Catherine street, creating two parallel streams of social discontent. The levees of predisposition could no longer contain the flood of dissent. Students and faculty from Communication Studies at Concordia University gather at Jean Belliveau sculpture before heading as a group to the protest. 2012 @ Krista Geneviève Lynes. When our group of 35 students and faculty from Communication Studies at Concordia reached Peel street — after meeting at the Jean Belliveau sculpture on avenue des Canadiens-de-Montréal — we could feel the mass of people from the successive ebb and flow of cheers that sent waves through the crowd. No one was immune to the gathering’s effervescence. But how many people were there and how many more were on their way? Demonstrators (including a fiusha-haired member of Concordia's Media Studies MA program) march on in what has been called "possibly the largest mass protest in Québec history." 2012 © Eduardo Fuenmayor. 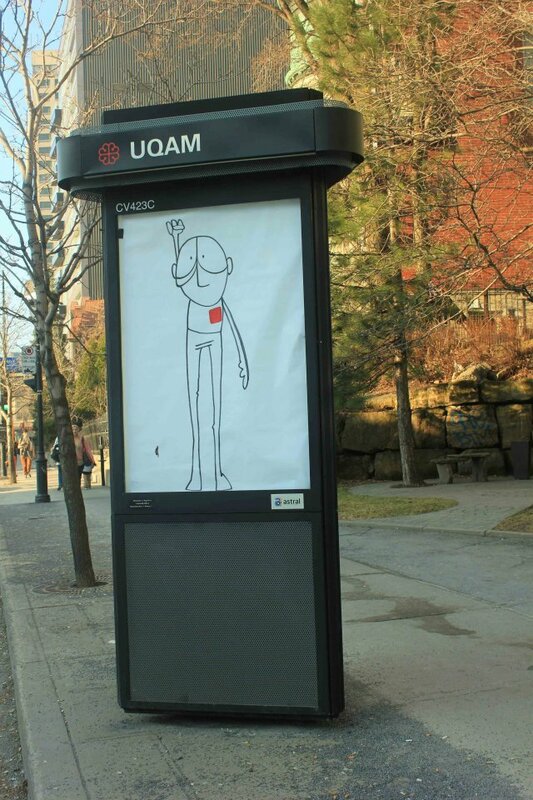 Protest signs began appearing very early this morning as a collective welcome gesture to all the students and supporters of accessible education who will ascend onto Montréal streets this afternoon in a mass demonstration of solidarity against the Charest government’s tuition increases. Below are a few samples. 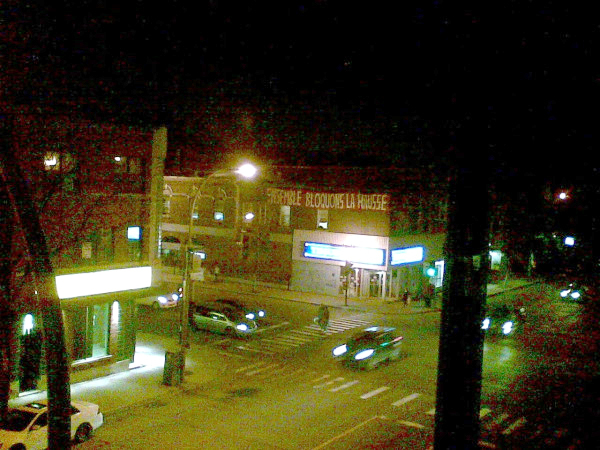 "Ensemble Bloquons la Hausse" or "Together let's block the Hike" appeared last night at the corner of Papineau and Ontario streets. 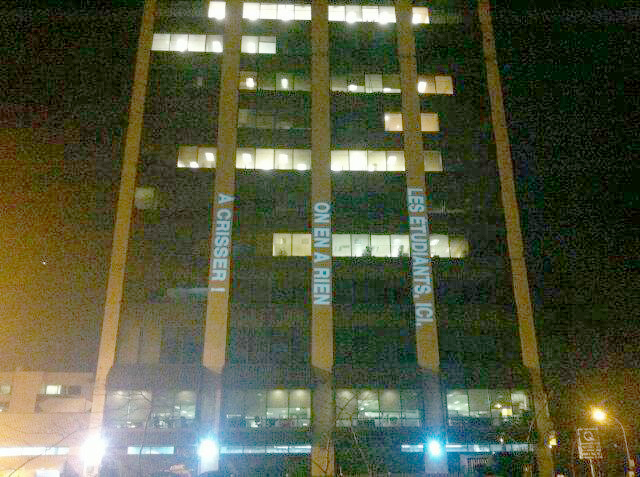 This photo of banners on a Ministry of Education building was circulated in the early hours of the morning. Photoshop or the real thing. I don't think it really matters. One of the 200 media reclamations done by Artung! yesterday. They are marvelous! 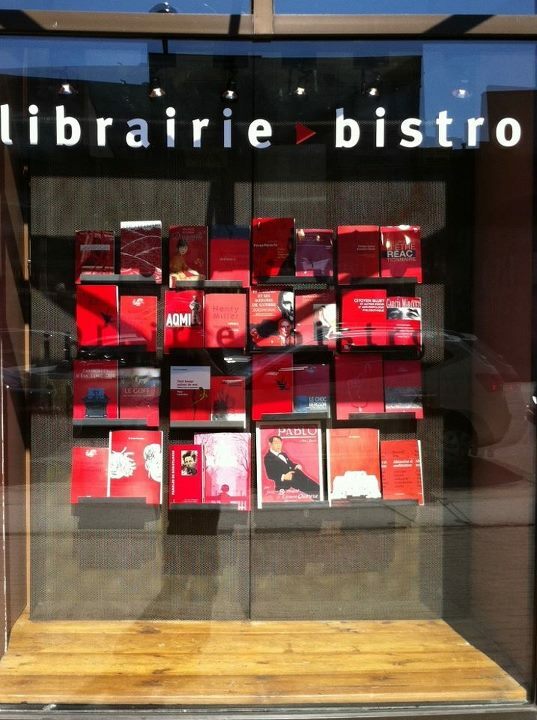 A red square of books at Librairie Olivieri, rue Côte-des-neiges.